For most of my career, I was a college admissions officer, the school administrator charged with the responsibility for determining which applicants were qualified to study at my institution. Because of my work in admissions, I was more than a little interested in a conversation I had with the chairman of a church committee appointed to determine the attributes and personality traits a person should possess to qualify for the ministry. Pardon me, but I always thought people were "called" to the ministry. I didn't realize there were specific qualifications, or, as Max Lucado puts it in his most recent book, Outlive Your Life, "God doesn't call the qualified. He qualifies the called." 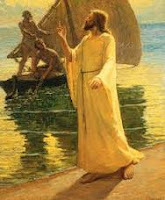 Jesus called Peter to get out of his boat and, “Follow me.” With that simple overture, Peter was invited to leave his family, his friends and his way of life to walk with Jesus. And who was this impulsive fisherman Jesus chose to be a disciple and his Rock? The New Testament describes Peter as a blundering, impetuous, hypocrite whose vocabulary was unpolished and coarse. But Jesus didn’t choose Peter because he was brilliant, well educated, sophisticated or because he scored well on a psychological test or personality inventory. Peter was not called because of what he was but what he could become. It is astonishing to recognize that when we accept the call to “Get out of the boat,” it’s not because of who we are or what we have done. When we choose to follow Jesus, we are forgiven for the sins we have committed, and we are given an opportunity to change and to live the life Christ wants us to live.